A relaxation-based massage. Your therapist will use a light to medium pressure to relieve muscle tension and emotional stress. A more focused, deeper massage to relieve chronic ‘knots’ and improve range of motion. Appropriate for clients with time or budget restrictions, this shortened session is great for general relaxation or addressing one specific issue. The ultimate in spending quality time together! A fabulous way to de-stress and realign your senses together. Two of our therapists will whisk you to our couples massage room where you can relax and enjoy your massages side by side. Our therapists are trained in a variety of modalities that can help clients seeking to improve performance and balance, recover from subacute injuries or pathologies and deal with chronic pain or musculoskeletal issues. One or a combination of the following modalities may be used to best address your body’s specific needs. Tap any name for more information. Active Isolated Stretching (AIS): is a method of muscle lengthening and fascial release developed over the course of the past 42 years by kinesiologist Aaron Mattes. The AIS method differs from other types of stretching and strengthening programs in several important respects. Specificity: AIS movements are precisely targeted to stretch individual muscles and parts of muscles, rather than larger muscle groups. There are over 170 separate stretches which can be combined to develop customized regimens tailored to the specific needs of any client. Active Initiation: Each AIS stretch is initiated by the client, which helps increase the temperature of the muscles and the fascia to enhance flexibility and create a more efficient stretch. Incremental Assists: The practitioner provides just enough assistance at the end of the client’s active range of motion, to typically add two or three degrees with each repetition. Gentle Motion: Studies confirm that to avoid injury, it is important to use 50% or less of the maximum force for the muscles being stretched. The gentle stretches of AIS are designed to help client’s avoid a defensive mechanism known as the “stretch reflex”. A movement that is overly sudden or severe will cause the muscle being stretched to reflexively contract. Brief Duration: The key to avoiding the “stretch reflex” altogether is to hold a stretch for only a short time--no more than two seconds. Multiple Repetitions: Results are achieved much more quickly by using 6-10 repetitions of shorter stretches. This helps increase the range of motion by as much as 60 degrees in a relatively short period of time. Deep Breathing: This helps to increase the flow of oxygen to the muscles, decrease muscle fatigue, and encourage the release of muscle tension and fascial restrictions. Active Release Technique (ART): ART is a patented, state of the art soft tissue system/movement based massage technique that treats problems with muscles, tendons, ligaments, fascia and nerves. Headaches, back pain, carpal tunnel syndrome, shin splints, shoulder pain, sciatica, plantar fasciitis, knee problems, and tennis elbow are just a few of the many conditions that can be resolved quickly and permanently with ART. These conditions all have one important thing in common: they are often a result of overused muscles. Kinesio Tex Tape is comprised of a polymer elastic strand wrapped by 100% cotton fibers. The cotton fibers allow for evaporation of body moisture and allow for quick drying. There is no latex in the tape. The thickness of the tape is approximately the same as the epidermis of the skin, limiting the body’s perception of weight and after ten or so minutes the patient will generally not perceive there is tape on their skin. The tape usually stays on 3-5 days and even after it has become wet, it will remain effective. The Kinesiotape may be used for a wide variety of clinical applications. There are 6 current Corrective Techniques. 1) Mechanical Correction “Recoiling” - tape can be used to assist in the positioning of muscle, fascial tissue, or joint. Functional support can be maintained without losing active range of motion or inhibiting circulation. 2) Fascia Correction “Holding” - to create and/or gather fascia in order to align the tissue. 3) Space Correction “Lifting” - to create more space directly above an area of pain, inflammation, swelling or edema. 4) Ligament/Tendon Correction “Pressure” - to create increased stimulation over a problem area to simulate more normal tissue. 5) Functional Correction “Spring” - used to create a sensory stimulation to either assist or limit a motion. 6) Lymphatic Correction “Channeling” - the tape helps to reduce pressure by acting as a channel to direct excess fluid to the nearest lymph duct. Note: Clients with body hair will need to shave the areas receiving the tape. Orthopedic massage is a multidisciplinary approach which integrates techniques from the worlds leading physical therapists, orthopedic, and osteopathic physicians. Used to treat a host of problems such as carpal tunnel syndrome, plantar fasciitis, shin splints, sciatic pain, knee conditions, low back pain, frozen shoulder, headaches and more, Orthopedic massage uses a clinical approach to balance the body and treat chronic pain and injury. Your therapist will use these specialized techniques to release chronic muscle tension, realign dysfunctional scar tissue, and increase your overall flexibility. The session concludes with a maintenance consultation designed to help you better understand your injury by teaching you the various stretches and strengthening exercises necessary for continued relief. 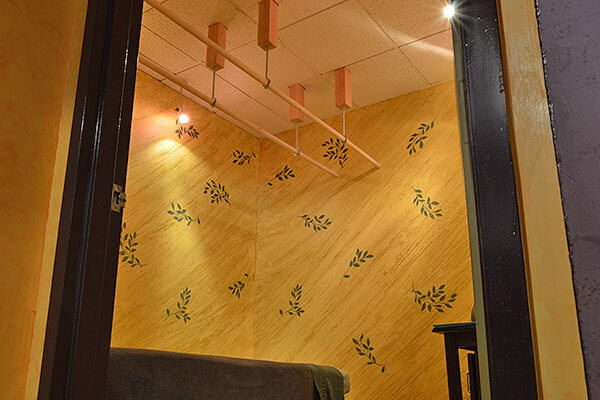 Use our sauna pre-service to detoxify your body, loosen stressed muscles and decompress your mind. Extensive research shows that this type of radiation heat is more beneficial than other saunas because of its therapeutic and tissue-regenerative properties. These treatments include a head, neck, shoulder, arm and hand massage with your choice of facial masks. A nourishing cream and warming mitts are applied to your hands to aid in your relaxation. *Our relaxing facial treatments are performed by licensed massage therapists and do not include extraction or steam. Not recommended for those with full beards. Collagen: : Enriched with vitamins A, C, and E, aloe vera, and other nourishing plant oils, this mask prevents premature aging and promotes radiant skin. Detox: This kaolin clay mask, infused with naturally antiseptic tea tree, basil, and camphor essential oils, deeply cleanses pores and helps banish bacteria to prevent future breakouts. SensiCalm: A cool, oil-free, gel mask with boswella serata extract, calms redness and inflammation. This mask is excellent for people with rosacea-prone or sensitive skin. Originating in the Moor lands of Central Europe, this special mud is known for its wide range of therapeutic properties. Moor Mud is a strong, natural detoxifier that helps muscle recovery by promoting circulation and relaxation. This service starts with a soothing full-body exfoliation and concludes with a hydrating body lotion with your choice of aromatherapy. Like a full body back scratch with the exfoliating benefits of a vanilla lemongrass sugar scrub for your hands, a lavender peppermint pedi-scrub for your feet and a citrus body polish for your body. After you are fully exfoliated you will be hydrated with a nourishing hand cream, a revitalizing foot and leg lotion and a soothing body butter with your choice of aromatherapy added. Are you having a really long week or just looking to treat yourself to something special? This service is perfect for when you need to relax from head to toe! Included with a 60 or 90 minute full-body massage is a foot scrub and reflexology to pamper your feet and your choice of any or our relaxing facial treatments. After all of your skin is renewed from a full body exfoliation refresh the rest of you with a 60 or 90 minute full body massage. Affecting every layer from your skin down to your muscle, this is the ultimate in pampering experiences. This service is a 60 or 90 minute massage that starts with a full-body dry brushing to awaken the skin and exfoliation to remove dead skin cells. A deeply penetrating Moor mud mask is then applied to detoxify and nourish the skin while you receive a reflexology treatment for your feet. The facial treatment of your choice will conclude your complete state of relaxation. Heated obsidian and basalt stones warm and relax the body to melt stress and tension away. The stones are placed on specific points to balance the body and mind, but are also used as an extension of the therapist’s touch and as a tool for deeper work. Focusing on the various zones and reflex points in the feet that correspond to specific regions and organs of the body, this massage can be both deeply relaxing and therapeutic. This session includes an exfoliating foot scrub and a peppermint and eucalyptus infused foot lotion. This gentle, rhythmic modality drains waste and excess impurities from each part of the body and carries useful white blood cells to the circulatory system. Perfect for post surgical procedures, sinus issues, eliminating and reducing swelling and edema, and more. Developed in Thailand and influenced by traditional medicine of India, China, and Southeast Asia, this massage is a combination of assisted, yoga-like, stretching, muscle compression, pressure point work and joint mobilization. Also known as “the lazy person’s yoga”, this session is done with the client clothed in comfortable active wear on a padded floor mat, and leaves the recipient feeling both deeply relaxed and energized. Watch a video on couples Thai Yoga Massage here! A relaxing massage incorporating specialized techniques and comfortably supportive pillows to address the specific needs of our pregnant clients who are past their first trimester. Although it’s origins are derived from eastern modalities, AOBT and the application are truly western. This technique utilizes specialized ceiling-mounted bars to allow your therapist to use the power of their legs and feet to deliver this deep and relaxing treatment. The therapist’s body weight is used to press, sweep, swirl, and relax the muscles. By elongating the spine and dramatically stretching shortened muscles, Ashiatsu can help to correct posture and movement, relieve muscle spasms, increase circulation, and aid the body’s lymphatic system in the release of toxins. Watch a video on Ashiatsu Massage here! Beginning with the balancing of the chakras, each session utilizes specific vibrations transferred to cells by tuning forks, causing a spike of nitric oxide within the body tissues. This release of nitric oxide sets off a cascade of physiological events that directly influences our health, wellbeing, state of mind and consciousness. If provided as a stand alone therapy, clients may remain fully clothed while lying on the massage table. An ancient form of alternative medicine in which a therapist puts special cups made of glass, plastic or silicone on your skin and the air within the cup is removed causing a vacuum effect. It is a safe and beneficial technique, administered for many purposes, including to help with pain, inflammation, blood flow, relaxation and well-being, and as a type of deep-tissue massage. In Clinical studies, patients with neck and shoulder pain experienced a 61% decrease in pain after receiving dry cupping therapy! Available for complimentary aromatherapy during your service. At Centre Ave. Massage and Spa, we offer 100% pure therapeutic-grade Doterra essential oils for use during your session both aromatically, and if applicable, topically as well. 15 different scents and blends to choose from. Read about them here. Relaxes muscles, calms tension, soothes irritated tissue, increases circulation, smooths limbs. Promotes tranquility and a sense of balance. Antidepressant properties which create a feeling of joy, and energy in cases of sadness and depression by improving the circulation. Helpful in case of headaches, sprains or muscle aches. Cleanses and soothes the airways, and can be applied topically to the chest, back or soles of feet. Calming to the senses. Aids in restful sleep. Mood elevator and stress reducer. Uplifting and mood lightening. Soothes womens’ monthly discomfort associated with menstruation. Revitalizing. Eliminates mental and physical fatigue, and increases feelings of happiness and joy. Calming, clearing and eases breathing. Promotes calmness, focus and a balanced state of mind. Exquisitely calming and relaxing. Topically applied, can soothe skin irritations and ease muscle tension. Purifying and uplifting, and also soothes aching muscles. Supports healthy immune function. Clears the atmosphere of environmental threats. Helps relieve and soothe tension in the head and neck, provides calming comfort. Relieves tension to the head and neck, eases breathing, increases positive feelings. Creates a sense of well-being and relaxation. Supports restful sleep. Peaceful and renewing.